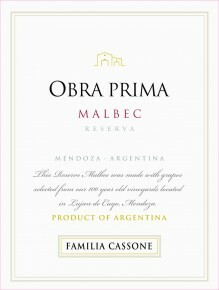 Obra Prima Reserve Malbec is a selection of 100% Malbec from 100+ year old vines in Lujan de Cujo (vineyard was planted in 1911), harvested by hand at peak of maturity and vinified with prolonged maceration on the skins to enhance concentration of ripe fruit aromas such as plum and blueberry. Aged for 12 months in French oak barrels. Full-bodied with a juicy finish. Enjoy with a hearty meal especially red meat cooked any style. Harvested by hand in small crates at peak of maturity. Traditional vinification with extended, cool maceration in stainless steel tanks.